If you do not have a computer with internet access or a printer, you can complete the annual emergency card update at your child’s school. Details about how to complete the process at your child’s school have been mailed to you. School phone numbers are listed below if you need assistance. In addition, the District Office will have bilingual staff, computers, and printers available Monday through Friday starting July 30 from 8:00 a.m. to 4:30 p.m. in the lobby at 3235 Union Avenue, San Jose, CA 95124. You can contact the District Office at (408) 371-0960 for further assistance. Thank you for completing the Annual Emergency Card Update and registering your student with Aeries Parent Portal online! Below you will find basic instructions. You will need access to a printer to complete the process. The process should take about 15 minutes. Para obtener instrucciones en español, haga clic en aquí. For detailed instructions with screenshots for new users, click here. For detailed instructions on how to reset your password, click here. For detailed instructions for returning users who know their password, click here. Click on Aeries Parent Portal. We recommend using Google Chrome. If you already have an account, please sign in and skip to step 13. If you have an account but are unable to log in, please click "forgot password" on the Aeries login screen to reset your password. If you need to create a new account, go to step 3. Check “Parent” on "Account Type," then click Next. Enter email address and create a password on "Account Information," then click Next. Find the email sent to you by donotreply@cuhsd.org to get your verification code. Enter the code from the email in "Email Verification," then click Next. Enter student information (can be found from the letter sent home) on "Student Verification," then click next. Your student is now added to your parent portal account. You can add additional students to your account by selecting "Add another student to your account." Please log out of the portal. You will need to login again. Please login to the parent portal. Verify student living conditions under “Family Information.” Check the boxes that apply to you. Click on “Confirm and Continue” when done. Please verify all “Contacts” information. You can click on “Change” to fix information that is incorrect. Click “Save” when done then “Confirm and Continue” Please select “Yes” for each parent/guardian for "Lives With Student?" You should also have emergency contacts including the student's dentist and doctor. Please use the "Employer" field for medical office names. Please review all items under "Documents" including the parent/student handbook and other important information here. Please note that some documents require that you print and sign them if you wish to utilize the service described, including forms for Lunch Services, Associated Student Body (ASB) purchases, and Student Accident Insurance. You will reach “Final Data Confirmation.” You can go back to the previous steps to confirm, then click “Finish and Submit,” and finally "Submit Final Confirmation." 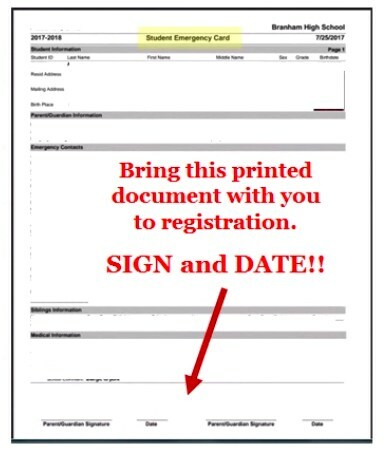 Please print and sign the completed emergency card. This will be required on your campuses registration/check-in day. The annual emergency card update is now complete. Please remember to bring any documents printed from the "Documents" section, ASB receipts, and the signed emergency card to your school's schedule pick-up/check-in day. If you have any questions, please click here﻿ to review an instructional video. You can also submit a support request here. 1. What if you need to make changes to your student's contact information after completion of the registration? You can login to the parent portal and look for the menu Student Info and select Data Confirmation. This will allow you to make any updates needed to emergency contacts and other fields. 2. My email is red and it won't let me make updates. How do I update it? 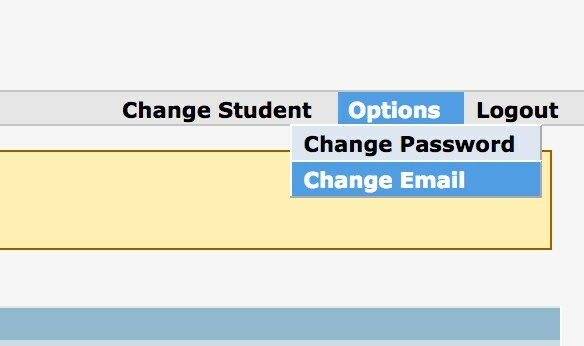 Email Addresses associated with a parent portal account must be changed by logging into the parent portal and selecting the menu "Options" located on the right side next to log out. You will find a menu item called change email. 3. How do I add an additional student to my account? Please login to the parent portal and look for the menu Change Student and select Add Student. You will then be prompted for the student's ID number, primary phone number, and VPC code. (This information was sent in the registration letter.) Please enter the information for your other student and they will be added to your account. You can also use the same parent portal account if you have students' attending different C.U.H.S.D. schools. Below is an example of a completed student's emergency contacts. Thank you for updating your student's information! Please feel free to provide feedback regarding this process by completing our survey.